Lusi Huang is a Risk Engineer for Chubb North America and joined employees from RMS on our annual Impact Trek in Nepal during March this year. This is Lusi’s trek diary. One of the first things that strikes me when arriving in Kathmandu, the capital of Nepal, is that the traffic is just like a bowl of spaghetti, a true jumble — there’s no traffic lights, no center line, all uneven road surfaces. Life in Kathmandu means that you just need to be patient. Another initial observation, solar power is big here, surprisingly there are a large amount of solar electricity and solar hot water panels installed on the roofs of Kathmandu domestic houses. 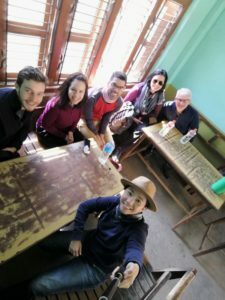 In Kathmandu, our first site tour was to the Pashupatinath Temple. Only Hindus are allowed into the sacred Pashupatinath Temple itself. It is the first time that I have seen a dead body cremated, just across the Bagmati Riverbank. God and death. The smoke filled up the entire area. It took a few moments for it to sink in. Death is just that close. The tour guide asked us to take photos and we just quietly look at each other and questioned whether that was a good idea. Life is a journey and by the end of the journey, every one of us is the same, regardless of being rich or poor, ordinary or great. Boudhanath Stupa is one of the largest stupas in South Asia and is also called Little Tibet. The stupa is solid. The dome represents the five elements of Buddhism: earth, water, fire, air, sky, which are very similar to the four elements of Christianity: earth, air, fire, water. Our ancestors all had similar beliefs in these natural elements. Build Change is a non-profit organization which for Nepal focuses on earthquake reconstruction across the country. 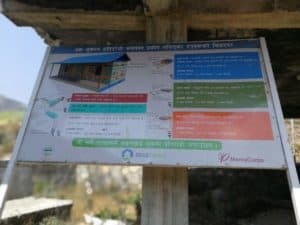 Build Change engages homeowners with the rebuilding process and works together with the local university, Nepal’s national engineering organization, and the government for the rebuild design and policy. Build Change in Nepal currently has around 100-110 employees and most employees are local civil and geotechnical engineers. Build Change has developed a mobile app and a cloud-based database to allow its field officers to communicate in real-time with the headquarters, while they are doing the rapid assessment and meeting with the building owners in remote villages. A new Building Design Library also enables Build Change to generate the new house designs within a few hours and at low cost. The Design Library is going to be publicly available for local builders and homeowners to use as well, via a mobile app which has been endorsed by the government. Now, Build Change is changing their focus from direct involvement with new builds to disaster prevention, the development of building and design tools, and training the locals and developing technical leads. Kirtipur is one of the heritage sites within the Kathmandu valley. The historical buildings within this small village feature different shapes, heights, construction periods and construction methods which make the pre-design retrofit process difficult. A “soft-story” on the ground floor is a common theme of these village buildings, as most the buildings have shops on the ground floor and residents live on the upper stories. There is no proper road to get to the village; even our 4×4 can’t drive through on a road this muddy. We end up leaving the cars and walking for an hour and a half to get to the village. This does make us fully appreciate the difficulty in transporting materials to these remote locations and the need to use local materials. No car can drive into the village during the monsoon season, so any construction materials have to be transported during the dry season (November to May). The retrofit houses we saw were well designed and put together, and remind me that the team has to work with the local materials, technology and budget. Sometimes we must forget about complicated design, technology and get back to the basic engineering principals. We spent a day at our guest house to put a Cat model together for Build Change. The RMS team are amazing. They can put together a basic Cat model framework within a few hours. The most challenging part is to simplify the model base on the limited data and resources that Nepal has and to re-write the scope that the model can be managed by Build Change. Dinner with the Build Change staff was wonderful. Nepali culture with Nepali food and wine are well represented. And of course, a more social environment is always the best way to get to know the team. The team presented the Cat model framework to Build Change and received a great compliment. A follow-up action had been suggested during the presentation and the team were enthusiastic for the upcoming actions and supporting the ongoing model development on a pro bono basis. Well done, RMS team, and thank you for giving me an opportunity to join this amazing journey and work with you.